Food and restaurant companies are under increasing pressure to make products healthier, but sometimes they don’t want customers to know when they have cut the salt or fat. Companies have employed the tactic, which some executives call “stealth health,” in tweaking products including Hamburger Helper, Oreo cookies and McDonald’sMCD -0.01% french fries. 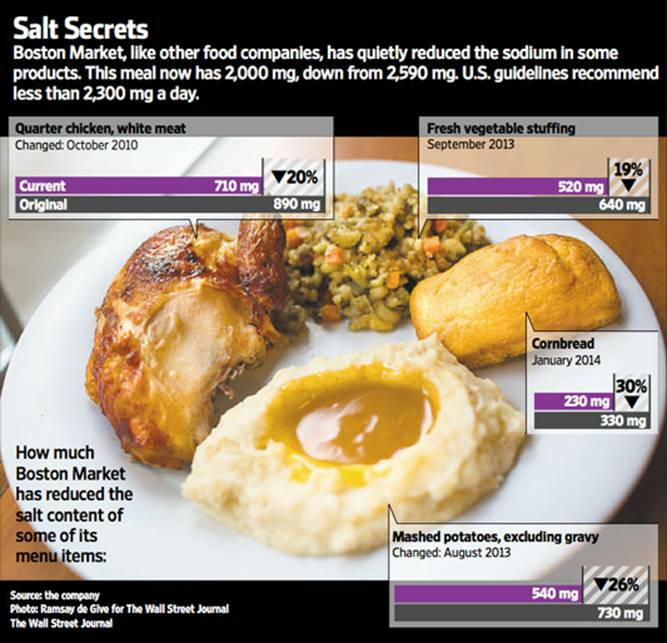 “When you tell people something’s healthy, they think it doesn’t taste good,” said Sara Bittorf, chief brand officer of Boston Market Corp.
Executives at the rotisserie-chicken restaurant chain didn’t advertise their efforts in the fourth quarter of last year to cut sodium in mashed potatoes, stuffing and other menu items at its 460 outlets until February—after the items appeared to have been accepted by consumers. It might seem like food companies would want to trumpet their health initiatives as much as possible. Many times they do, but companies are often cautious because altering the recipe of a successful product to cut salt, sugar, fat or other ingredients risks changing flavor and texture. Healthier products don’t always sell well. McDonald’s salads, introduced a decade ago, have never amounted to more than 3% of U.S. sales. And when the chain first announced in 2002 that it would start cooking french fries in oil free of trans fats—in line with health warnings about the artery-clogging dangers of the ingredient—its customer-service lines were flooded with complaints about the fries tasting different, even in cities where nothing had yet changed. The shift was so delicate that it took until 2008 for McDonald’s to settle on a canola oil blend that tasted right and start using it nationwide. A McDonald’s spokeswoman declined to say how much the reformulation cost, only that “significant effort was put forth to maintain the great taste of our fries while removing the trans fat.” She said McDonald’s doesn’t break out sales of any one item. Some franchisees estimate that between 60% and 65% of all orders include fries. The decision about whether and when to tell consumers depends partly on the type of product. Companies tout nutritional improvements in foods aimed at health-conscious consumers but might not for items that are considered indulgences. After General Mills Inc. GIS -0.68% reduced sodium levels in a line of Progresso soups in 2006, it highlighted that on the cans, because those consumers were seeking lower-sodium soups. The company knew it would have to be more furtive with nutrition-related changes to Hamburger Helper, whose customers didn’t say they wanted lower sodium. Over a six-year period, General Mills cut sodium per serving by 10% to 50% in more than 27 varieties of Helper. The four-cheese lasagna, for example, went from 740 milligrams of sodium per serving in fiscal 2008 to 470 milligrams in fiscal 2014. General Mills’ food scientists made the changes by adding ingredients such as garlic, onion, tomato, spices and herbs. But the company was careful not to tell consumers about the sodium cuts. The Dietary Guidelines for Americans recommend that people limit their daily sodium intake to less than 2,300 milligrams and that certain groups, including children and people over 51, consume no more than 1,500 milligrams of sodium daily. The changes apparently haven’t helped sales of the Helper line. U.S. retail sales of the product declined 18% since 2009 to nearly $318 million last year, according to IRI, a Chicago-based market-research firm. General Mills said many factors affect product performance, including increasing competition in dinner meals, so it can’t tell the impact of sodium reductions. At Boston Market, executives began talking about how to make their food healthier about four years ago. The chain, based in Golden, Colo., had already offered a number of low-calorie options and examined its menu to see what else it could improve. “We felt sodium would be the next battleground and we wanted to lead early,” Ms. Bittorf said. An early experiment showed that consumers don’t necessarily like restaurants trying to improve their health. In an effort to encourage people to taste their food before automatically adding salt, Boston Market removed salt shakers from the dining tables in 2012, placing them at the beverage station instead. “We had people say, ‘Don’t tell me not to salt my food,’ ” Ms. Bittorf said. Still, Boston Market kept salt shakers off the tables and customer complaints have largely died down, she said. With mashed potatoes, one of its top-selling side dishes, the company’s food scientists simply replaced table salt with sea salt, which has a higher taste-to-sodium ratio. Reducing sodium from macaroni and cheese was more difficult. It took about 15 iterations and more than a year of internal testing before the company arrived at a recipe that tasted right with an 18% reduction in sodium. The company began testing the new mac and cheese in January at 40 restaurants in Florida and said it doesn’t appear so far that anyone has noticed a change. Ms. Bittorf declined to say exactly how they did it. So far the company said it hasn’t received any complaints about the products it has reformulated. While it’s hard to quantify the sodium reductions’ impact on sales, the company reported same-store sales growth of 6.7% in the fourth quarter of last year, when the changes were rolled out. David Temkin, a frequent Boston Market customer, said he hasn’t noticed any change to his food and had no idea the chain had reduced sodium levels. Mr. Temkin, 39 years old, who owns a cosmetics company in Boston, said he actually would have liked to have known about the changes, because he takes medication for high cholesterol and high blood pressure.